Gulf of Mexico, Near Sarasota, Florida! 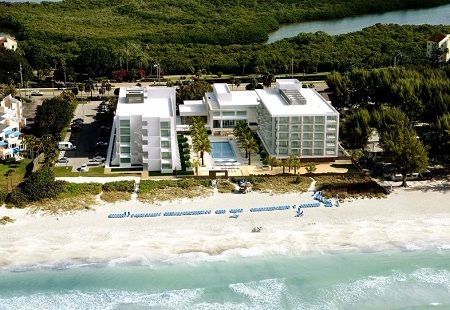 Zota Beach Resort at Longboat Key is the newest addition to Florida’s coast. The resort features 187 luxury rooms and suites, a sun soaked outdoor pool, an ultra-chic restaurant and even an wine bar which boasts an ambitious menu. Floridian beach vibes don’t just stay outside outdoors—the resort’s various rooms and suites all feature balconies or ground level patios bringing a coastal breeze right to your doorstep. Zota Beach Resort rests on Longboat Key, Florida—one of the sunshine state’s most prestigious beaches. Floridians also enjoy a moderate tropical climate throughout the year making Florida one of the best places in North America to visit all year long. Longboat Key is a mere 20 minute drive from the bustling city of Sarasota. This luxurious resort’s location makes it a prime destination for weddings, business meetings, and of course leisure. Between lounging on the beach with a cocktail in hand or relaxing at Zota Beach Resort’s luxury suites, guests will be able to sunbathe to their heart’s content. Each of the 187 rooms and suites at Zota Beach Resort feature balconies or floor-level patios. Other notable amenities included in each room: refrigerators, microwaves, Keurig coffee machines, and plush linens. For a fee, guests will also have access to the hotel’s private pool-side cabanas. Offer is based on a Single or Double Occupancy in a King Room Resort View Accommodations. King Guest Room with limited views - Also equipped with twin size sleeper sofa. *** Please note that there is a resort fee of $43.68 per room per night that is to be paid locally at the resort upon check-out. This fee is charged by the resort, and is NOT included in the $49 per night taxes & service charges.